I’m not sure I’d want to live in Merstham. It looks nice; lots of old fashioned looking pubs and houses, and even the petrol station canopy has been designed to not look out of place. But throughout the whole town you just don’t seem to be able to escape the road noise. The constant, pervasive thud and boom of traffic hurtling down the M25 at 80 miles an hour is irritating beyond belief. And it’s not just the M25 either for the town sits at a key interchange with the M23. One runs east to west, the other north to south. And Merstham sits right next to it all. Looking around at this motorway madness, I just knew this wasn’t going to be the best start to a day of walking. Nor did looking at the map help inspire either. Doing so revealed that the North Downs Way would be closely following motorways for the next 25 miles or so. 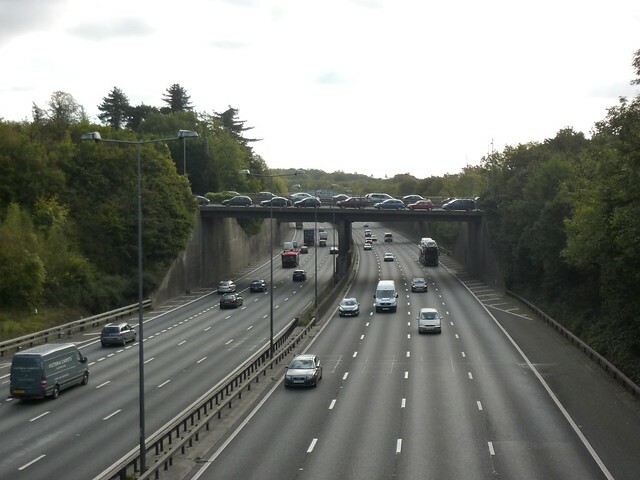 The M25, the M26, the M20… There was no escape. And unlike the previous day where the road traffic was heard but not really seen, today it would be regularly in full view. With the UK road network taking up a significant part of the land near Merstham, the North Downs Way had little choice but to leave the town by a road; If this had been Yorkshire or Cumbria this would have been a lane of quaint looking country houses but here in the South East I walked down a road full of large houses; most of which were hidden behind giant metal gates with CCTV cameras pointed poignantly on the driveway entrance. There was no one about as I pottered along, no doubt being silently watched on a hundred TV screens, as I made my way to the underpass which would take me under the M23. Having crossed the motorway I would, at least, be in more rural landscapes for a bit and a track through a farmers field led me up Ockley Hill so that I could get a good view of the intricate network of motorway flyovers; a series of junctions whose layout looked like a a flower on the Ordnance Survey map. 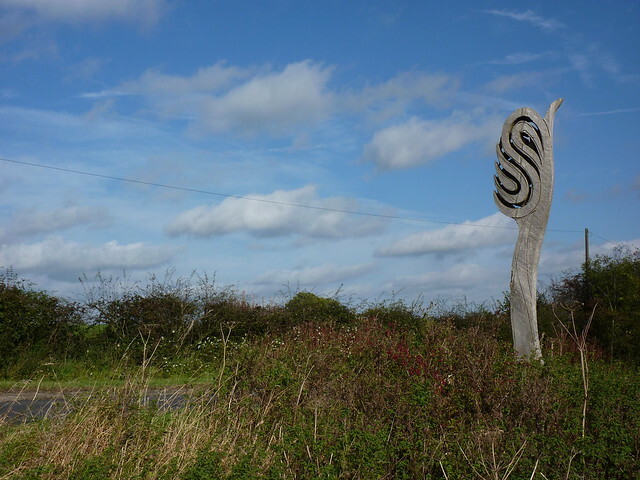 The field led to an earthy trackway known as Pilgrims Lane and up on the ridge, the road noise was louder than ever. Even the trees that surrounded the lane barely dented the din. 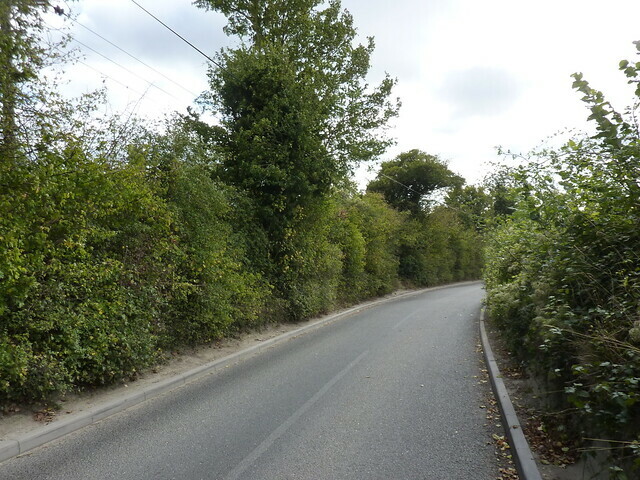 That lane then took me to a country lane; cars regularly speeding round corners and hitting the brakes on seeing me, as if astounded that someone might have the nerve and audacity to actually put one foot in front of the other rather than using the mighty power provided by petroleum. It was faintly dull walking, and even passing by the derelict folly of Whitehall Tower struggled to lift my interests. A building curiously named War Coppice House, similarly failed to amuse. The names on the map all had a curious feel about them. Spring Bottom Lane. The Mardens. Gravelly Hill. The Moyle House. Oldpark Wood. Lots of minor places all with impressive names, yet a hill where you could sit on a bench and watch the world go buy (if you like watching HGVs hurtling around the country anyway) just seemed to have the faintly boring name of “Caterham Viewpoint”. It was nonsensical name. 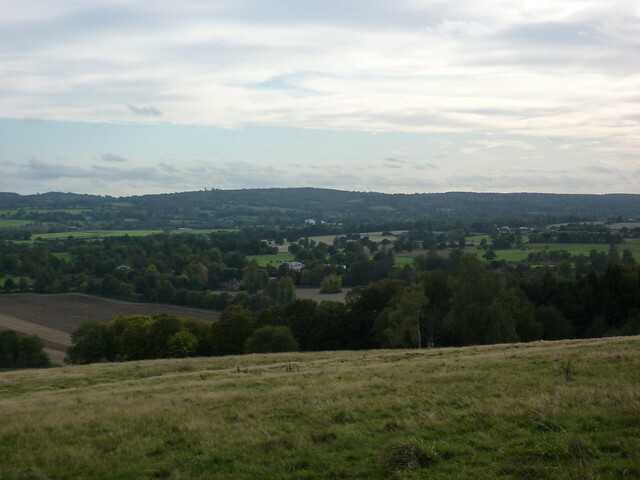 The spot gave views south of Betchingly, not Caterham which was positioned a few miles north and completely invisible. A footbridge large enough for a car took me over the the busy A22 dual carriageway and into a woodland area which had a giant warehouse shoved in it. I’m sure that decision made sense to someone. From my initial approach it seemed to be shut up tight, perhaps mothballed for some unknown purpose, but as I walked around it I found a busy car park and a few open doors suggesting something was going on there, even if there wasn’t a sign to tell me what. More houses, a vineyard and a couple of hours later and I was finally beginning to feel like I was actually in the countryside again as the trail pootled along more tree lined tracks; occasional gaps in the tree-line providing regular updates on the state of traffic. Hmm, moving quickly I see today. Oxted was coming in to view, and the North Downs Way decided to head down hill via an incredibly long and steep set of steps which seemed to be directing the walker to the entrance of the Oxted railway tunnel which was popping out of the hill beneath my feet. 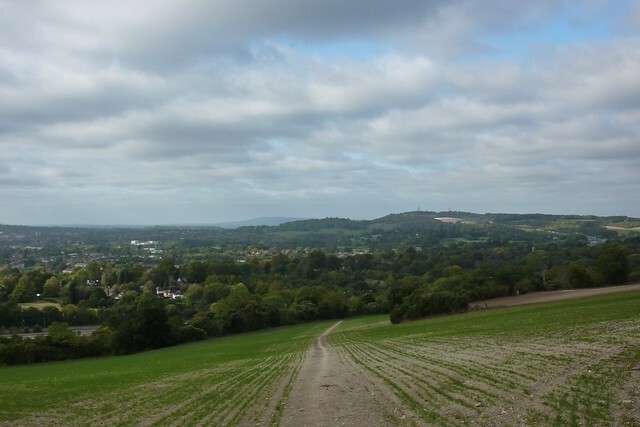 Of course the North Downs Way wasn’t going to take walkers along a railway track and it abruptly headed away once more, skirting along a field top before heading down the side of a quarry to the Oxted road. Merstham to the Oxted road is eight miles and the remaining two to the town (which lies off-route) and its railway station would take me to ten. An acceptable days walk indeed. But looking at my watch left me with a conundrum. It was barely 1pm and I’d only been walking for three hours. This just didn’t seem enough. I wanted to carry on; it was nice weather so why not? There was just one slight catch and that was that the next place I could finish happened to be another 12 miles along, requiring me to walk twenty miles in one day. Looking at the map there was just no other option. Should I call it quits and head home, or go for a serious stretch of the old legs? In the end it was the M25 that decided it all for me. The thought of coming back another day and suffering its noise once more just put me off. It was time to put the miles in and get away from the confounded thing. Ironically, having made that decision the North Downs Way headed away from the ridge and the motorway and the noise quietly disappeared. Unfortunately it was replaced by traffic on local roads as the path hugged busy country lanes; cars zooming by at regular intervals. Still, inbetween it was quiet. Until the strains of my mobile kicked in. And with that, serenity was restored. More large houses lined the quaintly named Chestnut Avenue. This road also included a large milestone marker which marked the fact that I was now about to leave Surrey and enter Kent. Crossing the boundary resulted in a large difference, but sadly not one that anyone particularly would want. All morning I’d been seeing signs in Surrey about the use of CCTV to catch people flytipping. There was no camera that I could see but it was obvious that all some people had done was driven across the border and dumped their stuff there. Old bags of building materials, a child’s car seat, even a plastic slide all casually dumped on a track in the middle of nowhere. Obviously I wasn’t of the same mindset and all I could do was shake my head and sigh. For most of the day the North Downs Way had been going roughly in the same direction, but having crossed over the road at Westerham Hill it suddenly started veering off in all manner of directions as it started doing random twists and turns through the Kent countryside as it headed away from the ridge I’d mostly been following during the day. The wide panoramic views had disappeared and now I was traipsing through farm fields; walking over paths made of sticky and gloopy mud, doing my best to follow the myriad of waymarks which pointed the walker off in different directions at alarming regularity. Then at Star Hill the road was suddenly back as the twin combo of the M25 and M26 came into view in the distance. Wearily I slumped on the ground, resting my tired legs before heading off again down the incredibly steep slope that would take me down to a series of roads that would eventually allow me to cross the motorway before leading me the remaining mile and a bit to the town of Otford via a housing estate. The train station was on the other side of the town, although thankfully on the North Downs Way itself, but being tired and thirsty I was more interested in finding some refreshment. Otford’s range of stores however had a different audience in mind. Flower shops, accountants, antiques and even second hand bridesmaid dresses could all have been purchased, however the good folk of the town clearly had no need for fluid. Haircuts could be had a plenty, but if you wanted a flapjack or maybe a sandwich, no chance it seemed. With no choice I headed to the station, hoisting up a bunch of carnations in one hand and an embroidered strapless gown within the other. There was a train due, and after twenty miles of walking I was ready for a sit down. Next time: there’s some respite from the motorways as the North Downs Way makes its way to cross the River Medway. I enjoyed reading your post. Last year I walked from Northfleet to Dover Castle via the NDW for charity. The most enjoyable section was from Wye through to Dover where you do finally get away from the major motorways. Walked from Merstham to Oxted last night as I didn’t want to waste my weekend doing a boring stretch of the walk, but I thought it wasn’t too bad! 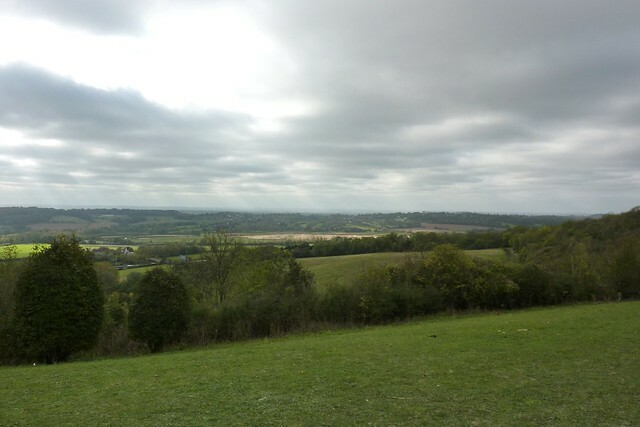 the view of London from Ockley Hill is amazing, and for the most part of it I seemed to be walking through woods quite far away from the road. have to admit that bit where you go along the road for a while is annoying and quite dangerous … anyway your guide has been very useful for this trail thanks for taking the time to make it! 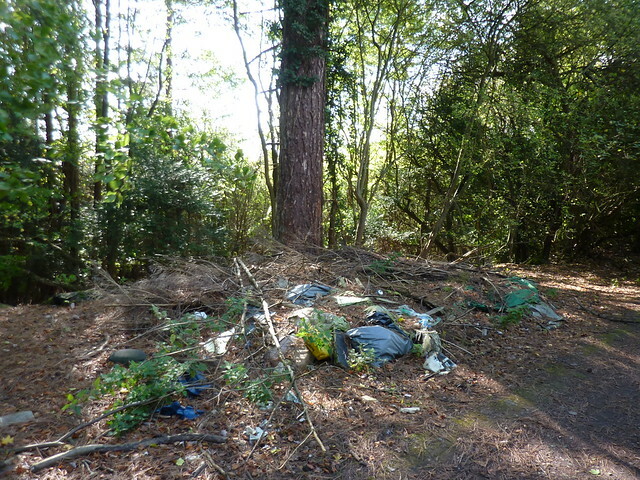 You’ll be thrilled to know that there’s now plenty of fly-tipping in Surrey too, based on my walk last weekend. Progress, eh? First Published: 23 January 2013. Last Updated: 16 November 2014.